← Summer reading? How about tackling Miracles by C. S. Lewis? Sometimes as you age, it’s easy to think that things you leave behind have disappeared for everyone. The Boy Scouts and Girl Scouts, for example, faded from my view for a few decades, coming back into sight only when I had a son and a daughter of my own. The same is true of comics. When I was a kid, I read just about everything that was available, from Superman, Batman and the Flash to Casper, Archie and Richie Rich. (Marvel Comics weren’t big when I was growing up, or if they were, I missed them.) Again, as I grew older, the comics scene receded, along with my hairline. 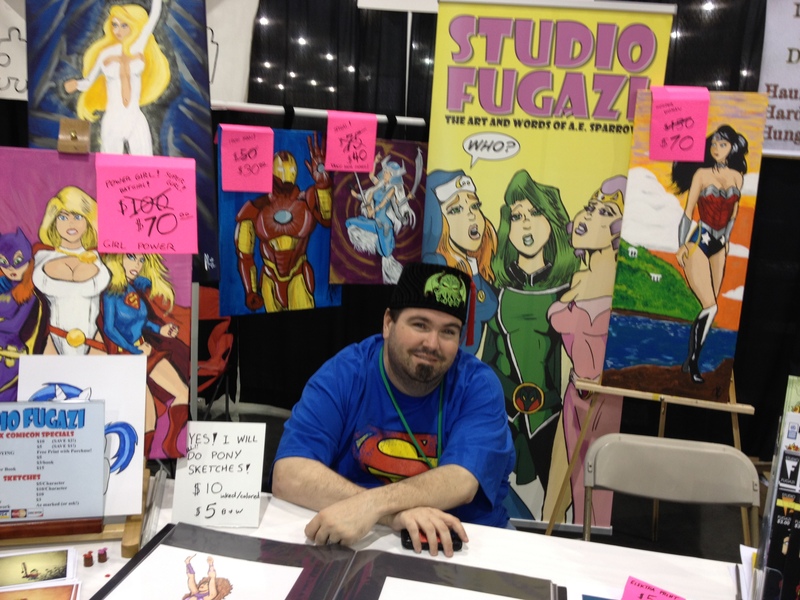 This past weekend, I learned that comics are bigger than ever as I attended Phoenix Comicon. More than 30,000 people turned out for the event, many of them dressed as a comic book hero they loved. It was a far cry from the images normally associated with Arizona – cowboys and survivalists. It also was a lot of fun, and it brought an estimated $5 million into the Phoenix economy. On Saturday, I attended a panel session on the comics scene in Arizona, moderated by Al Sparrow, owner of Phoenix-based Studio Fugazi. Al and his collaborator, illustrator Stephen Reid, are trying to hit it big with a comic series they call Thugs. Al says he got the idea for Thugs when, while watching the Batman TV series from the ’60s, he noticed that the arch villains would change from week to week, but the henchmen and goons – the Thugs – always stayed the same. It was as though the Thugs worked for a temp service and would be hired out each week to whatever arch villain was in town. What if one day, he thought, one of the thugs got off a lucky shot and actually took Batman out? He’d been scorned both by the superhero community and the arch villain community. I’m working my way through the first four issues, and they’re a fun read. Like just about everything else in the entertainment industry, comics have been democratized and revolutionized by the Internet and the media explosion. It’s a relatively easy thing to print your own comic books these days. The tough part, of course, is getting an audience connected and engaged with what you’re doing and willing to put down good money for your product. The dream lives on for lots of aspiring comic book artists. In the exhibit hall, more than 300 booths hawked everything from comics to toys to the latest video games. I estimate that at least a third of the exhibitors consisted of self publishers with a collection of goods ranging from Christian Comics to Carnal Comics. Phoenix Comicon also attracted all manner of celebrities, from William Shatner and Ed Asner (currently popular for his voice work in the movie Up) to Wil Wheaton and LeVar Burton for the Star Trek: Next Generation crowd. Lou Ferrigno appeared to be especially gracious in his willingness to spend time with fans. 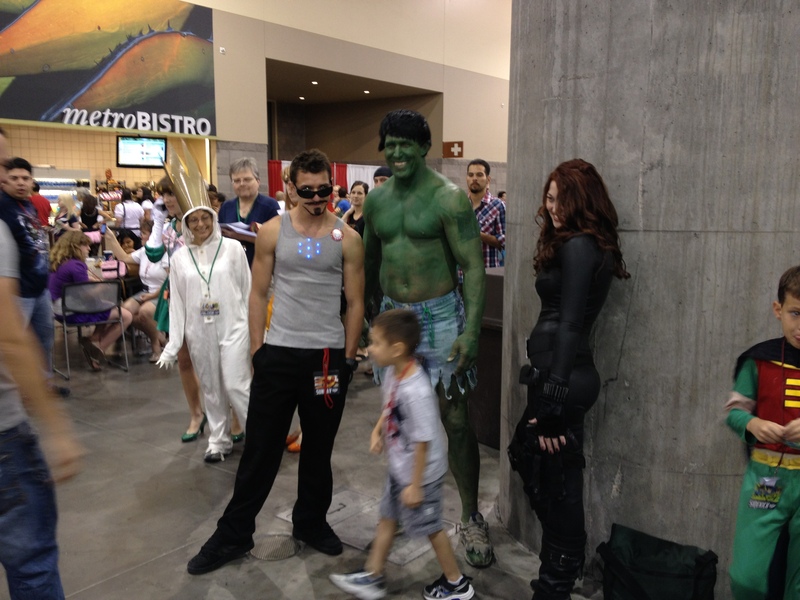 This was the 10th Phoenix Comicon. A couple of people I talked to said they prefer it to the Mother of All Comicons, San Diego, because Phoenix is more affordable and more navigable. Put No. 11 on your calendar for next year, and come to the desert for a weekend of escapism and fun. This entry was posted in Arts & Music, Communications, Society and tagged comicon, comics. Bookmark the permalink. It was actually the 12th Comicon, as you can tell from the 12 at the bottom of the logo this year. Catherine, thanks. I saw lots of media coverage calling this the 10th annual PHX Comicon, but now that you raised the issue, I’ve found even more calling it the 12th annual event. Great article and review. 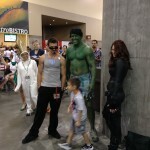 It was my second year at PhxCC and second ComiCon. It was a blast this year just like last year, but even better organized. Looking forward to next year! Great article and acknowledging the economic impact of the event to Phoenix. $40 of that $5-million was mine. I’ve never gone to a geek show before, not even San Diego. I bought my ticket to see Captain Jean-Luc Picard, but a Star Fleet captain was replaced by a non-commissioned officer (even though he flew the Enterprise), Wesley Crusher. Great marketing move on the convention’s part. I would have loved to see Doctor Xavier. Richard, it’s good to hear from you. I read that Patrick Stewart (Jean-Luc Picard) could not make it to Comicon because of an acting job that materialized after he agreed to appear. I’m not sure I’ll go again next year, but we’ll see. It was more fun than I expected.